I’m apparently on a bread kick, so here’s another loaf for you! I had actually intended to make this bread for a catering event I was doing, but my yeast didn’t proof and I was too tired to get more at the time. So I bought bread and new yeast the day of the catering event and served Whole Foods’ bread and made this when I got home. This is a great bread. It’s good for sandwiches or dip, good with butter or with hummus, flavorful enough on its own but not so overpowering that it can’t be paired with other things. In a small bowl, add warm water, yeast, and sugar, whisk to combine and allow to sit while you assemble the dry ingredients. In a large bowl, combine both flours, garlic, rosemary, and salt; mix well. Whisk the olive oil into the yeast mixture, then pour the liquids into the dry ingredients. Stir with a wooden spoon until all the flour has been moistened. Turn the dough out onto a lightly floured surface. Knead the dough for about 8 minutes, adding more flour as necessary until the dough forms a smooth ball. Place dough in a lighly oiled bowl, turning over so the top is oiled. Cover loosely with plastic wrap or a clean towel and let sit in a warm place until doubled in size, about 2 hours. After the dough has doubled, turn the dough out onto a lightly floured surface and press to deflate it. Cut the dough in half and shape one half at a time. Press the dough into a square, then roll it up tightly. Turn the cylinder 90 degrees and roll up again from the short end. Place seam side down and cover loosely with plastic wrap and let sit 5 minutes. Repeat with the other half. Dust large 11″x13″ jelly roll pan with cornmeal. Gently roll the dough to elongate the cylinder, working from the center out. Place the loaves seam side down on the pan and dust lightly with flour. Cover with plastic wrap again and allow to rise again until doubled, about 1 1/2 hours. After about 1 hour if your bread has made progress, preheat your oven to 450°F and position the shelf in the center of the oven. 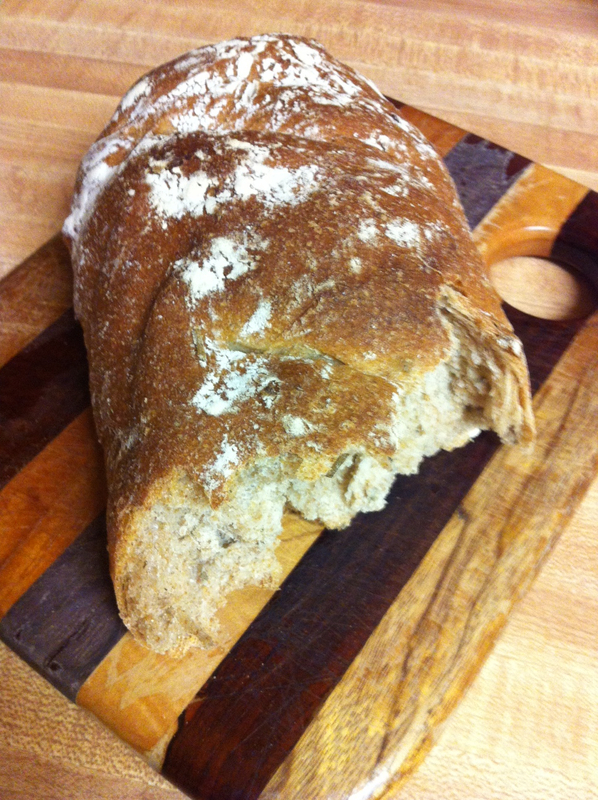 Once the dough has finished rising, use a sharp knife to cut 3 or 4 slashes across the top of the loaf. Immediately place the loaves in the oven and bake for 18-22 minutes, or until golden brown and sounds hollow when tapped. Remove the bread to a wire rack and allow to cool.